Travelling over the Snake Pass in the car to the start of the race I was half-expecting the race to be cancelled due to snow, in fact when I saw the forecast I left the ‘fast’ road bike at home and opted to bring the sensible (and heavier) bike with full mudguards, but as we descended down the road things cleared up and the sun came out. Stood on the line, near the front, I looked around at the crowd of experienced triathletes and wondered how far from the front I’d be after the first 7 kilometre run. As things turned out, by the time I got 2k down the road I was quite a long way back…. As usual, after 15 minutes or so of running I started to warm up a bit, felt a bit more comfortable and started to pick up the pace and lengthen my stride. I wasn’t overtaking anyone but the earlier slide backwards through the field of runners didn’t get any worse and I arrived at the transition area in 30-something’th place. No problem I thought, I’ve got a bike to ride now for the next 18 miles. 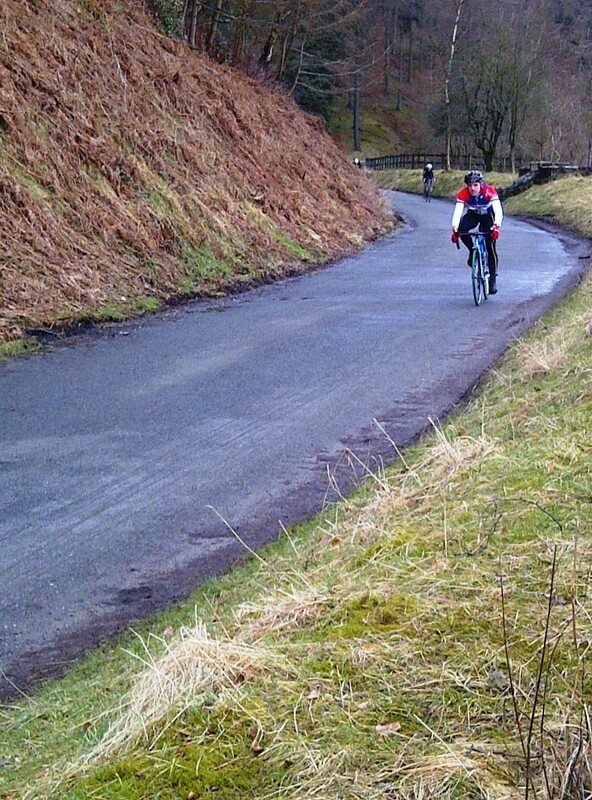 I tore off in pursuit of the riders in front of me along the narrow road by the side of the reservoir. It was an out-and-back route that had to be ridden twice and the terrain was somewhere in between “nicely undulating” and “a bit hilly”. So not too difficult to bomb along like a nutter. I arrived back into transition a bit later on in 10th place, or thereabouts. Now I had to bugger about with my shoes again, taking my helmet and gloves off, racking my bike….thinking about it, I might have lost a couple of places in transition. “Getting changed at high speed” isn’t something I’ve ever rehearsed. The last leg was a 5k fell run. To be perfectly honest I wasn’t expecting a full-on fell race to finish a duathlon. I thought it would be a relatively tame trail run in fact. Don’t know why. Anyway, I was wrong. Very wrong. The final run headed out of transition, along the road for a little bit and then went BAM straight up the hill next to the dam. And I mean STRAIGHT UP. I joined the line of tired people, pushing down on their thighs with their hands, towards the top of the fell where things levelled off a bit and I was able to stuff my lungs back down my throat. Shortly afterwards the trail headed down. It was very rocky, loose and STEEP. Many other runners dropped back at this point so I took advantage of it and was only overtaken by one runner, his descending technique/insanity a bit better than mine. 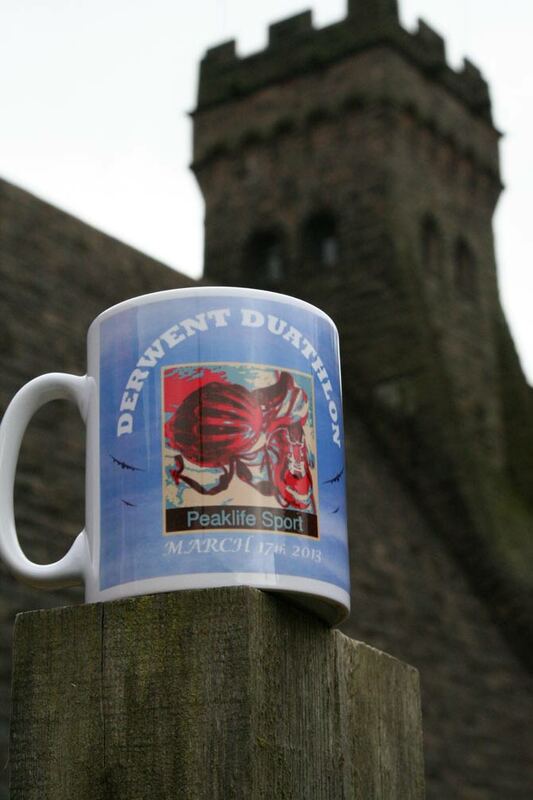 I arrived at the finish line by the iconic Derwent Dam in 11th place (3rd in the 40-something category) and received a brilliant mug with a Lancaster Bomber on it. What a great event! Hopefully the organisers will do it again next year.